These are the best pans as nothing sticks. They're going to be great for healthy cooking as none or little oil is needed. These pans cook wonderfully well and clean up like a breeze. Unfortunately, even during the short time I've had them, they are beginning to show wear on the copper coating despite our using only nylon or wooden kitchen tools with it. I would spend more money on a better set with hardier coating. Very good value. Easy to clean. Highly recommend. 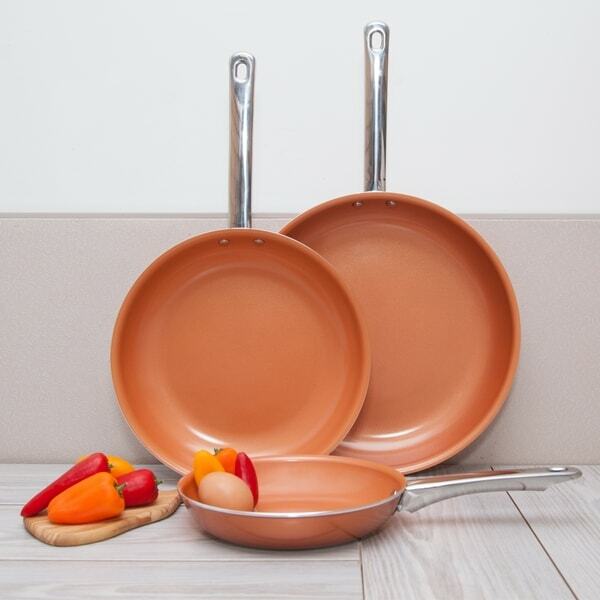 I LOVE THESE NON-STICK COPPER CERAMIC FRYING PANS!! They really are durable, when my husband cooks breakfast it doesn't burn or stick to the skillet! The clean up is easy and they look like new after each use. These pans are so beautiful, I hate to put them away! My favorite set! I order these cooking pans and today was the first time I’ve try one out and was very disappointed. They are hardly worth the price everything sticks to them nothing slides out like advertised. I would like to return for a full refund. These are lightweight but very strong. I love the color. The way they perform is out of this world. Will buy again and one set for my daughter. It's very good for cooking and cleaning.Very good. 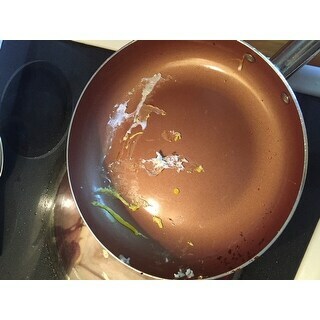 I use very often for frying and after I don't have any problem to clean.Food is very good and delicious.This frying pan Skillet set is perfect for baking in oven too. 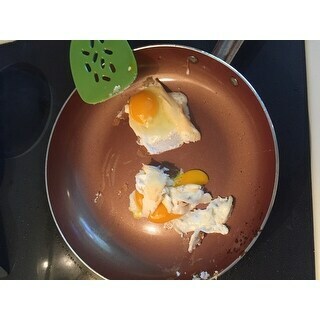 My daughter kept telling me to try the copper frypans. I was a little skeptical. Can I tell you these pans are amazing. Nothing sticks to these pans. I believe I paid under $30 for 3 copper fry pans. These pans are worth a lot more in clean up alone. You just rinse them out wipe them down so easy to clean. The pans clean up with minimal effort. Be careful when handling because the handles have no grips to protect against the heat of the handles. Food does cook evenly in these pans. Delivery was timely and the packaging was secure. Love them! They’re wonderful! I can’t say enough! Totally nonstick. Just a great great, great product. I really can’t jimmy if anything else today about them. I just know I would buy them again if I needed to. I love, love, love these pans. They are truly non-stick and cook very evenly. wonderful buy, my family loves it . You will Love these pans! Stand up to wash and wear!!! I had original as sold on tv. And they were not as advertised! These pans are beyond sturdy! They have lasted long and take a beating! You will not be disappointed!! This was one of the best Overstock deals! These pans are wonderful! No sticking, no scratching, and such easy cleanup! "Are this dishwasher safe? Oven safe?" Yes, these are dishwasher and over safe. "Are these APEO and PFOA free?" "Are they compatible with induction cooktops, or not?" Price and reviews. I hope they are as good as they look. "Do the pans come with lids"
Whether you prefer stainless steel over nonstick-coated cookware, or simply want to make your pans a little more versatile, we'll show you how to effectively season your cookware in 5 easy steps. Cookware Buying Guide from Overstock.com. When it comes to cookware, it's all about the metal, and here's what you need to know about the different types. Best Cookware for Electric Stoves from Overstock.com. It's important to know which cookware material will work best with your type of electric cooktop.